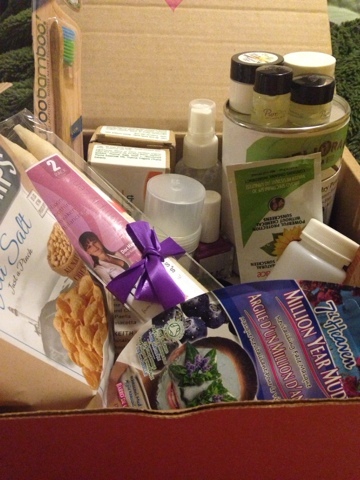 The Ecocentric Mom Mystery Box is only $40.00 and came stuffed with fabulous goodies! Simply 7 Hummus Chips. We actually reviewed these hummus chips a couple of years ago HERE. LOVE them!!! So delicious! Amazon Value: $2.52 (based on a per chip bag value). Salon Solids conditioner bottle. This is the oddest addition to the box. It is an empty bottle. We can always use empty bottles, but it seems odd. I could not find this item on the Salon Solids website for a value. Sunny Face Natural Subscreen .2 oz sample from Goddess Gardin Organics. Amazon per ounce value: 74 cents. Natural Skincare Pure+Remedy Botanical firming eye cream. .25 oz Website could not be found for value. Total value: $105.28!!!! Amazing value for only $40!!!! Want to win a mystery box of your own? Just enter below! These are amazing! Thank you for the chance! I love the fact that you have different ones available too! Fingers crossed on this one! Love it!! Amazing!! So excited!! Thanks so much for the chance! this is the coolest thing! I'm going to send one to my pregnant friend! Thanks so much for the chance! !